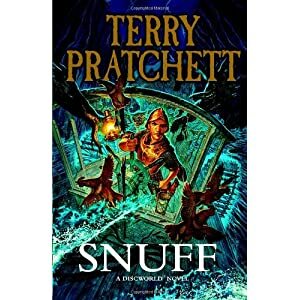 I expect to be unavailable for a few days while I read the new Terry Pratchett book, Snuff. This happens whenever a new Terry Pratchett comes out. Don’t be alarmed. On the other hand, if you don’t know who Terry Pratchett is, I would highly, HIGHLY recommend giving him a read. My favourite place to start would be Guards! Guards! which is the first book in this story line, and quite a good read. His early writings are a mix of parody and satire, moving toward social commentary in his latter works, all set in a magically funny world. In other story lines set in the same world, Sir Pratchett developed a magical University long before Harry Potter, the whole cannon is worth a read… it is just that some books are easier to start with than others.